The Pythagorean theorem, or Pythagoras' theorem is a relation among the three sides of a right triangle (right-angled triangle). In any right triangle, the area of the square whose side is the "hypotenuse" (the side opposite the right angle) is equal to the sum of the areas of the squares whose sides are the two other sides of the triangle. 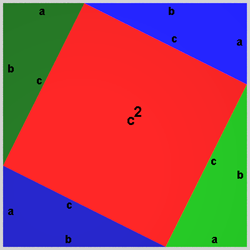 where c represents the length of the hypotenuse, and a and b represent the lengths of the other two sides. 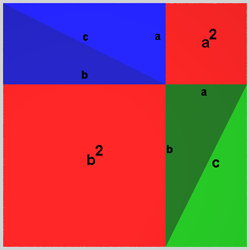 The large square on the left consists of the square on the hypothenuse and four of the original rectangular triangles, the same large square on the right is composed of the squares on the two other sides of the rectangular triangle and four of the original rectangular triangles. The animation shows how the rearrangement of the triangles can be done. The area of the red square on the left equals the sum of the areas of the two red squares on the right. And that's what Pythagoras' theorem states!